What’s one thing about your car you would change if you could? For many vehicle owners, it’s the audio system. Many factory audio systems cannot offer the clarity, precise stereo imaging and full-range sound of an aftermarket solution. Here are some ways your local retailer can help you easily improve the sound in your vehicle without spending a fortune. Installing an aftermarket radio (often called a “headunit”) is the ideal way to upgrade the sound in your car, no matter what vehicle you drive. Aftermarket headunits offer features like satellite radio, HD Radio and iPod playback and control, plus multimedia features like DVD playback and 5.1 surround sound decoding. Many also allow you to add modules like Bluetooth, navigation, backup cameras, etc. Installers often use vehicle-specific “fit kits” that are contoured, textured and colored to match your vehicle’s dash, so your aftermarket stereo will have a factory-looking fit and finish. Be sure to ask your installer about options for retaining your steering wheel controls and other vehicle systems that interface with the factory radio. The dash designs and integrated controls in some cars may make replacing the radio impractical or impossible. Rather than replace your factory radio, another option is to simply improve its sound. One great way to do this is with a high-quality digital connection for your iPod, smartphone or tablet PC. Referred to as “integration kits,” these solutions provide an all-digital input for connecting portable devices and external components directly to your factory radio. For example, you could use a kit specifically designed for your car to stream the high-fidelity digital audio from your iPod directly through the factory audio system with no loss in quality. In many cases you can even control the iPod or other portable device using the factory radio buttons, touch screen controls or steering wheel controls. The result is great sound and seamless connectivity. Speakers are another easy upgrade to a factory stereo. Your local automotive electronics retailer can show you a host of upgrade options, including adding or replacing the tinny-sounding factory tweeters or bass-shy and distortion-prone door speakers found in many vehicles. The results are dramatic. Aftermarket speakers reproduce your favorite music clearer and with less distortion at higher volumes. And with improved clarity and stereo imaging, they will present a large and open virtual “soundstage” in front of you – an immersive concert-like experience that’s just not possible with most factory speakers. A common sound quality issue with factory systems is bass response. The smaller-sized door or rear-shelf speakers can’t reproduce the deepest tones – the ones you can not only hear, but feel. Just like with a home theater system, to get full-range sound you need a subwoofer to handle the lower octaves of music. Powered subwoofer solutions feature built-in amplifiers and crossover networks to provide solid bass without making much of a footprint in your cargo area. For the ultimate fit and factory look, consider a custom-fit subwoofer tailor-made for your exact make and model vehicle. We touched on just some of the strategies for improving the sound quality in your vehicle. Aftermarket headunits are a great way to improve sound and add additional features; however, if you want or need to retain your factory radio, upgrading speakers, adding a powered subwoofer and adding high-quality digital audio sources will also dramatically improve sound quality. For a more complete demonstration, contact a local automotive electronics retailer. To find a retailer and MECP-certified installation technician near you, type your ZIP code into the search box at the top of this page. 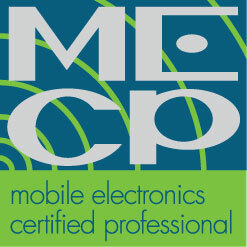 Make sure to have your new audio equipment installed by an MECP-certified installation technician.